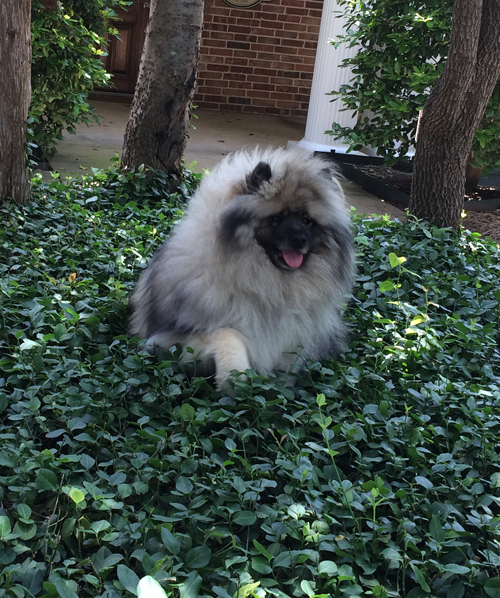 Mya is a Keeshond (pronounced Kazhond). The breed is a Wolfspitz breed and also known as a Dutch barge dog because they originated in the Netherlands and were brought on the barges with the workers for companionship and to sound the alarm if there was any unexpected person or activity going on onboard the barge or dock area. They are companion and alarm dogs, meaning they have a good alarm bark to let their people know about anything happening. They tend to respond to anything being outside of the norm; hence sounding “the alarm” to their owner but they don’t have much of a prey drive and are not aggressive. The nature of the breed is to be loyal, friendly and interested in what’s going on; Mya is a sweet girl but can be a little aloof, unless there is food involved of course! This is just part of her watch dog personality so no one should take it personally. Mya loves coming “to work” and her job is to greet people, direct them to and from Renee’s office and she’s often utilized by Heather Robinson, LCSW who sees children and adolescents to reduce their anxiety and increase confidence. Mya responds positively to calm and confident energy! Numerous clients have commented that having Mya in the office helps them feel safer and more relaxed as they work through difficult traumas.